Halloween-Theme Picture Books and Free Printables for Kids! A Very Brave Witch is the tale of a green-skinned, broomstick-flying, costume-loving witch. She thinks she knows all about humans and decides that Halloween night is the perfect opportunity to take a closer look. After a flying mishap, she meets three, costumed human trick-or-treaters including one girl who is dressed up as a witch. Together, the pair manage to shatter stereotypes as they discover friendship and celebrate Halloween together. Young readers will enjoy investigating a recently-decorated haunted house and collection of costumes. The witches’ fear of humans is good fun. Well-suited for a group read-aloud, the colorful watercolor illustrations nicely match the tone of the story. Beautifully-detailed, dark and creepy illustrations are a highlight of this Halloween-theme counting book. Rhyming text includes alliteration and guides readers as they count from one to ten and back down to one). Recommended for children aged 5 and up. 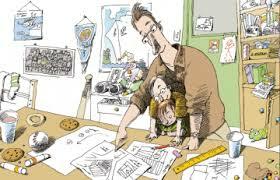 Illustrations are well-suited to a group setting and could be used to inspire young artists to work primarily in black. Scaredy Squirrel is a fun series of picture books written and illustrated by Mélanie Watt. In Scaredy Squirrel Prepares for Halloween, Scaredy has put together eight short chapters featuring panels with maps, lists, illustrations and diagrams intended to keep trick or treaters safe and happy. Best suited to independent readers or a one-on-one read aloud, this is a fun book with rich vocabulary and detailed, engaging illustrations. Not great for a large group setting, this will be a very satisfying “chapter book” for a child in grade one or two and will produce lots of giggles when read by a parent to a child. When a moving truck pulls up to a haunted house, the ten resident ghosts watch nervously. Before too long, a green-skinned witch is scaring the ghosts with a skeleton , a bat and various costumes. Ms. O’Connell provides fun clues for readers to notice including buttons that look like eyes , white face powder and a roll of toilet paper. Repetitive, rhmying text adds to the fun in this counting book. Young children will love finding the ghosts in each of the illustrations. A delightful, cheery picture book, One Two That’s My Shoe by Alison Murray will have tremendous appeal for toddlers, preschoolers and older children. Beautiful illustrations direct readers to notice numbers and what is to be counted in each spread. Very well-suited to a classroom or a library read aloud session, the illustrations are bold and large enough for a group setting. Georgie Dog picks up one of Grace’s shoes and within minutes a chase ensues. Georgie jumps over three teddy bears and races past four wooden blocks. Soon after, he rushes outside and into the garden. This is a playful pup with a winning personality. He is clearly having fun until he encounters ten upset chickens. A special delight and highly recommended. Whether planning a day at the beach or just back from some fun in the sun, these beach-theme picture books will be a wonderful addition to your summertime fun. Suitable for toddlers, preschool age children, kindergarten and older, these stories address important themes like fear of the water and getting outside one’s comfort zone. Whenever possible, it is very valuable to have children read books that match their experiences. These stories are perfect for introducing new concepts and extending learning. Have fun! 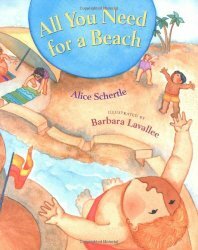 Picture book about a day at the beach published by Harcourt, Inc.
A companion book to All You Need for a Snowman, this is an exuberant celebration of a group of children, playing together in sand and water. Bright, cheerful colours and a happy theme of exploration and cooperation highlight this picture book for toddlers and preschool-age children. Illustrations depict a racially diverse group of children. For many adults, books are a great source of information as well as entertainment. Whether searching for a delicious recipe, researching an upcoming family vacation or deciding if a visit to the doctor is necessary, books can be inspiring, entertaining, informative and reassuring. Just as adults seek information from books, children gain understanding and confidence as they explore new and unfamiliar situations through books. Whether beginning preschool or heading off to school in September, there are many delightful picture books available to help you and your child make the transition with relative ease. 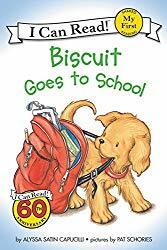 Biscuit is a truly outstanding series for beginning readers. Beautifully illustrated with engaging pictures that will help a new reader to determine meaning. Classroom depicted is racially diverse. Ready, Set, Preschool! features stories, poetry and detailed illustrations that will enable youngsters to explore a typical preschool classroom, experience a field trip, observe playground activities and more. As well, the illustrations and text offer opportunities to practice counting, identifying colors and shapes, recognize rhyming words, the alphabet and letter sounds. Since late winter, I have been working with a speech delayed child. She is five years old and she will start kindergarten in September. Initially, I worked with her for one hour each week. After a month or so, her parents were delighted with her progress and they asked me to double the frequency of our sessions. Currently we meet Tuesday and Thursday afternoons for one hour. This year I am determined to find the best way to organize my personal library. At the same time, I hope to “weed out” a few titles. After all, there is only so much space I can devote to picture books. You are no doubt familiar with Felicia Bond’s lively illustrations in If You Give a Mouse a Cookie. Here she tells the story of Cornelia Augusta, a girl who is caught in a rather unusual rainstorm. On The Day It Rained Hearts Cornelia collected hearts of all different shapes and sizes and then set to work making Valentines for her special friends. Before setting to work, she thinks carefully about each individual and she creates cards and gifts that suit each perfectly. She found seven that were more or less alike and strung them together with a needle and thread.”I know just the right person for this one,” she thought. 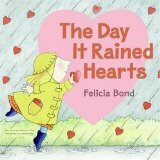 The Day it Rained Hearts encourages thoughtfulness and creativity. A lovely choice for your young Valentine or for sharing at a February storytime. Extension activities could include a search for hidden hearts, comparing and categorizing hearts and creating Valentine’s Day cards and gifts. Lilly is a beloved picturebook character. Best known for Lilly’s Purple Plastic Purse , she also appears in Lilly’s Big Day, Chester’s Day, Wemberly Worried and Julius The Baby of the World. Before going to bed on Valentine’s Day, Lilly must decide what to do with her one remaining foil-wrapped Valentine’s Day chocolate. Those who know Lilly, will agree that she is exhuberant and sometimes just a little bit impulsive so finding the perfect place for the precious chocolate is quite a challenge. 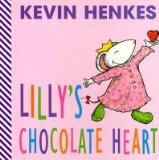 Lilly’s Chocolate Heart will be a delicious treat for Lilly fans who will no doubt notice her purple plastic purse hanging from a dresser drawer handle and a painting of the purse that hangs on a wall.